This Chocolate Cupcake recipe makes moist, delicious cupcakes! These chocolate cupcakes, from my Best Chocolate Cake Ever, are so easy and always favorites for the Best Chocolate Cupcakes! Chocolate cupcakes. Not just any cupcakes…but the best chocolate cupcakes. But I guess it just makes sense that I would share my recipe for the Best Chocolate Cupcakes. Especially since I’d been talking about my chocolate cake, the best chocolate cake ever , so much before sharing this cupcake recipe. So many of you had told me how much you loved the cake too, but you have Claire to thank for these cupcakes. A while back, Claire emailed me and said she needed some help. She wanted to make a special treat for her fiance and wanted to make a dozen cupcakes like the cake. When someone sends me an email asking for my help, I try to do everything I can to help them. And, sometimes that results in my family eating more chocolate. They really love that. Since I’d only doubled the recipe to make chocolate cupcakes for a crowd, I wasn’t entirely sure I could tell her without a shadow of a doubt that she could only make 12 from the recipe. So I went to work. As a side note, whenever you can say that testing for the best chocolate cupcakes is work, you know you are pretty lucky. Anyway, I also wanted to be sure to size a frosting recipe to work perfectly with the amount of chocolate cupcakes. Even though having extra buttercream frosting doesn’t seem like a bad idea, I always try to keep the recipes even when I share them. These are not only the best chocolate cupcakes in my book, but also about the easiest ones I’ve ever made. 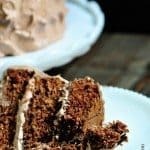 Since I used my amazing chocolate cake to create this recipe, I knew these were going to be the most moist, rich and delicious chocolate cupcakes. There are a couple of ingredients that make my cake – and these cupcakes – different and the best I’ve ever had. One of these is the boiling water. It’s so important to my recipe, so please don’t skip it even though you may think it sounds strange. 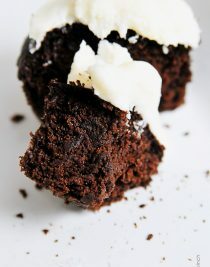 It will make the cake batter thinner compared to most other batters, but it results in a very tender and moist cupcake. Like I said, this recipe is so simple. The batter can easily be mixed in a bowl without using heavy duty stand mixers. This makes it great to throw together after your family has gone to bed or bright and early in the mornings. Can you tell I’ve done that a time or two? 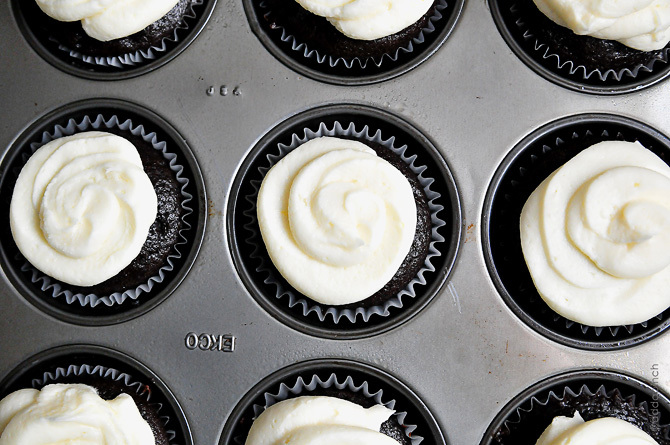 I kept it simple, yet scrumptious when frosting these cupcakes. They are topped with my delicious Vanilla Buttercream Frosting. The taste combination of the rich chocolate and creamy vanilla is amazing! 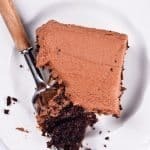 You can also use my Chocolate Buttercream Frosting, or Cream Cheese Frosting, or even my delicious Peanut Butter Frosting. They are all great on these cupcakes. I just put all of my buttercream frosting into a zip top bag, snipped off the corner and went around on top for a generous bit of frosting. Of course, you can get fancy with them if you like, but I know that my family just likes things good and simple. So, if you love chocolate and are looking for what my family calls the best chocolate cupcakes, this is your recipe. It’s also perfect if you enjoy my recipe for the best chocolate cake ever and just don’t need a whole cake. And if you know someone who needs a little bit of cheer or has some celebrating to do, this is great. Let’s just declare it chocolate cupcake day and go make them! 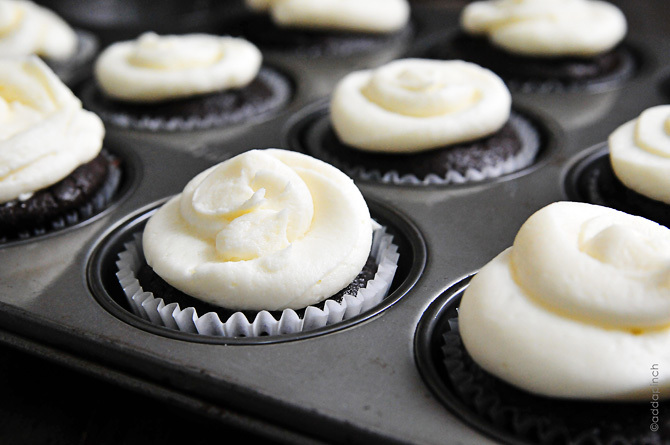 Here’s my best chocolate cupcakes recipe with vanilla buttercream frosting. This recipe yields 12 cupcakes and can easily be doubled. 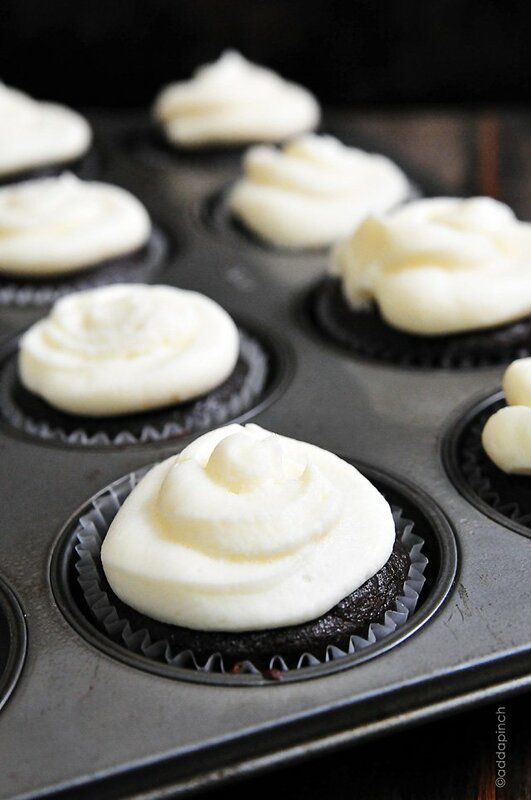 Get this easy recipe for Chocolate Cupcakes with Vanilla Buttercream Frosting. Add milk, vegetable oil, egg, and vanilla to flour mixture and mix together on medium speed until well combined. Reduce speed and carefully add boiling water to the cake batter. Beat on high speed for about 1 minute to add air to the batter. Evenly distribute cake batter. Each cupcake liner should be about 1/2 full. Prepare Buttercream Frosting according to instructions. YES! 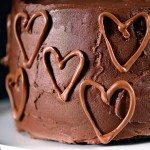 I love the Best Cake Ever recipe and went online today LOOKING for a similar recipe for a small batch of cupcakes. I feel so lucky :). Thank you! So happy you found it! 🙂 I hope you enjoy the cupcakes as well! Thanks so much, Kate! Hi Robin, can I check with you if possible for me to triple this recipe? You may want to make three separate batches as I do believe it will give best results. That’s a large quantity of cupcake batter to try to mix at once. Enjoy! I just made 60 cupcakes using this receipt for my daughter’s baby shower. You saved the day. They were AMAZING. The espresso powder and boiling water is the kick that takes them over the top. How creative and clever. This will be my go-to for chocolate cake, etc. Thank you for making this labor of love a success. Robyn..I’m making this recipe today with my 6-yr old grandson and have a question. In the directions, you indicated that the cupcake liners should be sprayed with a cooking spray and wondered why it’s necessary. Also, do you keep the baked cupcakes in the muffin tin until they are fully cooled? Looking forward to making these with my little baker-buddy! I did not use cooking spray and mine came out clean. Made these today . . . best cupcake recipe EVER !! Thanks so much! Glad you enjoyed these! Oh my word! These cupcakes are amazing! I have my tried and tested cupcake recipe and was a bit nervous to try something different…but it was worth every silly worry! Absolutely scrumptious! Thank you very much Robyn! I made the cake version of this and loved it. I plan on making these for my son’s birthday. His party is on Sunday, if I made them ahead of time would Friday be too early to make them? I’m so happy you enjoyed the Best Chocolate Cake, Amanda! When I’m baking cake or cupcakes for a special event, one day in advance is as far ahead of time as I go. I like to have them as fresh as possible to serve at the party. I hope you enjoy them and your son has a wonderful birthday party! Thanks! Hi Robyn, I’m excited to try your recipe! I just have a quick question about the cocoa…do you use unsweetened? And is it a bar or powder? Thanks! Hi! Can I use brown sugar instead?thanks! I’ve never made these with brown sugar so I’m not sure how they would turn out. I used the large muffin pan and no liners. Yielded 6 cupcakes. I made a second batch because the frosting recipe made a lot of frosting. I’m so glad you like them, Renee! Thanks so much! I will defenetly try it out made the cake several times very nice. Can I use soy milk instead of cows milk? Do the cupcake liners have to be sprayed? I’ve never used soy milk in these cupcakes. It will be good to prepare the liners. Enjoy! Thanks! I made these with soy milk and they were delicious! Thanks for the recipe! Hey could u do mini cupcakes instead and would they turn out fine? You can do mini cupcakes with this recipe. You’ll want to adjust the baking time appropriately. I have a hard time finding espresso powder. Where do you recommend going? If my grocery doesn’t have it, I order it online. I hope this helps. Enjoy! Thanks! Spicehouse is where I ordered mine! You don’t have to refrigerate if you make these the night before – I just keep mine under a cake dome or in a cupcake carrier that seals to help keep them fresh. These are amazing! I omitted the espresso powder (because it’s expensive!) and used freshly brewed coffee instead of the boiling water. 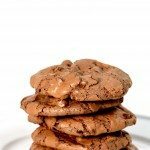 They are so delicious that I made them for a wedding and got rave reviews. Thanks for the recipe! Thanks for this very delicious chocolate cupcake recipe. I tried it this weekend and I loved it, moist, fluffy and light. But I’m just wondering if I can also us the same basic ingredients in making a vanilla cupcake (omitting cocoa, espresso and baking soda) and by substituting the cocoa powder with 1/2 cup flour instead? I really want to make other flavoured cupcakes but with the same texture as yours, advise please, thanks. Can you make this without the espresso powder? Just omitting any type of coffee all together? Yes, you can make without the espresso. They’ll still be delicious! Thanks! Can you tell me if the cocoa is natural cocoa powder (Hersey’s) or dutch cocoa powder (alkalized)? Thanks! You could use either, but I use the regular unsweetened cocoa powder (natural in your words). Hope you enjoy the cupcakes! Thanks! Hi Robyn, We are in Canada and natural cocoa powder is only available at the bulk food store in our area, dutch cocoa is stocked everywhere else though, so I thought I would ask which kind you use in the recipe. I made these cupcakes with natural cocoa for my daughter’s birthday in October and they were amazing! 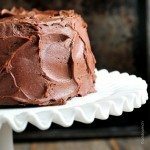 I needed 36 so I used this recipe plus your chocolate cake recipe all in one batch. My kids and I made these again tonight just for fun and they really are the perfect chocolate cupcake! I’ve made these for three birthday parties now and got rave reviews’ from both kids and parents! I always top it with the vanilla buttercream or other vanilla frosting. They’re delicious. I’ve also made both the 13×9 version of this and the 3-tier round cake. It comes out amazing everytime. I’m always surprised at how liquidy the batter is but it all works out in the end! So happy you enjoy them, Nadia! Thanks! Hi! Any chance I could substitute unsweetened applesauce for the vegetable oil? I often do that with other recipes. Hi I was just wondering if you have options of making this recipe gluten free? I absolutely LOVE this recipe but need to make a gluten free batch for a friend. Thank you! I’ve made them numerous times using a gluten-free flour blend, such as Cup 4 Cup or the King Arthur gluten-free blend. I hope that helps! I made this today and it turned out perfect! This will be my to-go chocolate cupcake recipe from now on. Thank you for sharing! Has anyone tried making these ahead and freezing them without the icing? They should freeze just fine – just let them cool completely after baking, them wrap well in freezer wrap and store in freezer in an airtight container. Thaw completely before frosting. Enjoy! Thanks Sara! My cupcakes came out DELICIOUS! Do you have a vanilla or yellow cake recipe!? Glad you enjoyed these! Here’s my White Cake recipe I think you’ll like too! Hi. Can I use cake flour instead of all purpose? Is there going to be a modification? You can use cake flour if you wish. Hope you enjoy them! Thanks! Hi. What adjustments do i need to do if i will be making mini cupcakes? I’m curious why you bake them on 325 degrees? Typically, you’d bake at 350. I’m going to try them this weekend! Thank you SO MUCH for sharing this recipe! I just made it tonight, along with another recipe and my husband and I loved this one so much more. It was fluffier, more moist, and the flavor was more intense and smooth! Definitely saved as my go-to now. Oh, and it was so much easier to make!!! Didn’t need a mixer at all! Delicious, rich and moist. I used boiled coffee instead of water for more coffee flavour even. As only my husband and I at home this is a nice small batch. These turned out amazing!! I used coconut oil (melted) and it worked perfectly. The boiling water keeps the coconut oil melted until baking. This reciepe is so tasty and easy to make!! Love this reciepe so much. Everyone says it is better than buying from stores. I recommand tp add some m&m’s to make it even tastier! Definately try this reciepe!!! Can I add cream filling? This recipe is by far the best chocolate cupcake recipe I’ve ever tasted! It’s so tasty, moist, and spongy. 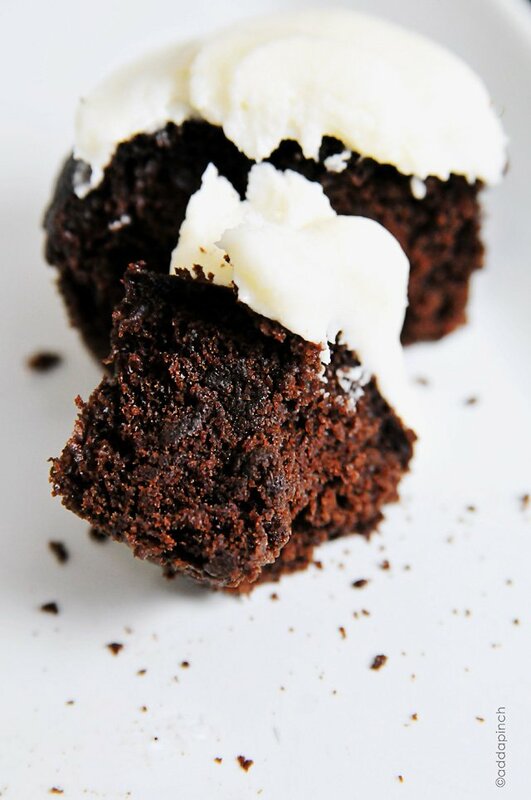 You can even add chocolate chips to have a double chocolate cupcake. Even the icing recipe was so delicious! Thank you so much for sharing this recipe! I need to make these for Friday night. Can I omit espresso powder. and use some kind of coffee as a substitute? And do you have a yummy chocolate buttercream frosting to put on these for a chocolate lovers 60th birthday? Delicious! Moist and chocolately, but not too sweet. Loved the espresso powder in this recipe. Adds just a little richness. So glad you loved it, Susan! Yes, the batter is very, very thin, but makes the best chocolate cupcakes, I think! These cupcakes were honestly perfect. The only change I made was to use brewed coffee in place of the water. This will probably become my go-to chocolate cupcake recipe! I’m so glad you enjoyed them, Shari! There’s nothing like a great chocolate cupcake! Hello Robyn! Okay so I have a dilemma… I know the batter is thinner than others but exactly how thinner? Mine looks like hot chocolate! By the time you reply, I probably will have baked them but at least if they don’t work then next time I can use your tips. Also I am crossing my fingers because they look so good!! Thank you so much! I know it’s a super late comment, but I actually ladle my batter into a protein shaker bottle and utilize the offset large opening to pour it evenly and cleanly into my cupcake tin. I place my cupcake tin on my scale and ensure I pour an even amount into each tin (I think it was something like 45grams per cupcake). It’s quite easy when the batter is as thin as it is. I made the cake recipe and it was amazing! Can I just use the cake recipe for cupcakes? If so how many minutes baking time? 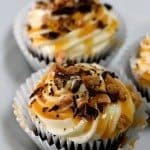 I need to make 650 cupcakes, how would I modify this recipe??? Since I’ve never made that many at once, I can’t say how mixing it all up in large batches will do, so I’d suggest making in smaller batches. Can I turn it into an actual cake? If so what about a sheet cake? I’m making a Black Forest cake and this is my favorite chocolate cup cake recipe. Thank you!! I first tried this recipe 2 weeks ago and I’ve already made 6 dozen since then. It’s incredibly easy to make and when it grows it forms plenty of pillowy pockets inside. I ladle my batter into a protein shaker with an offset opening and pour it into the cupcake tins with ease. They are the stick to your teeth kind of moist. Awesome recipe! Can you make as mini cupcakes. Help..I just made these and they are so dry…I doubled all the ingredients to make 2 dozen. I double checked my ingredients and they were correct..can anyone tell me what I may have done wrong?? It was good Robyn! Was just wondering how you could lower the amount of sugar? My family is trying to be more health conscious but still loves our chocolate! Have made many different chocolate cupcake recipes. This recipe is by far the best one I’ve tried! Everyone loved it! This is now the only chocolate cupcake recipe in my book! Thank you! Can’t wait to try some of your other recipes. Am looking for a recipe for peanut butter cake if you have one. is that unsweetened or dutched possessed cocoa powder? hi would duched processed powder really work?